Our Ariel Antibacterial Powder is a highly effective laundry powder for both domestic and commercial use. It boasts a combination of brightening agents, activated bleach and high-technology enzymes. This gives it 5 core actions in just one wash which removes the need for additional products and benefits your janitorial budget in both time and financial savings. It works powerfully in all water hardnesses and remains phosphate free at all times. The large and highly concentrated formula allows you to clean a large number of washes before requiring a replenishment purchase. In turn, this reduces the need for additional packaging to support your eco-friendly initiatives. 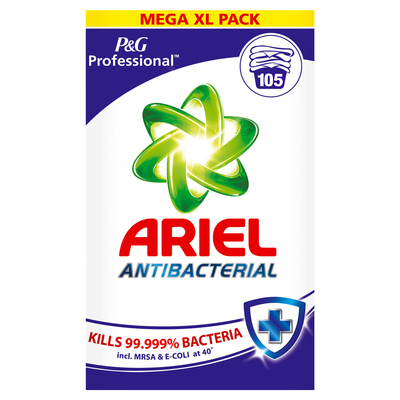 And, to give ultimate peace of mind, this Ariel antibacterial powder has been tested to kill 99.999% of most common found bacteria. Our range of Janitorial Supplies is constantly updated with high quality and economic products. Alongside this Ariel antibacterial powder, we also stock hardwearing Microfibre Socket Mop Head through to Gompels Orange Multisurface Cleaner - everything your busy company needs.